Cast Away had quite an infuriating marketing campaign. The first time Oscar�®-magnet Tom Hanks and director Robert Zemeckis had worked together since Forrest Gump, the film was a guaranteed smash. To seal the deal, the trailer used the "reveal all" technique on display with Zemeckis' earlier What Lies Beneath, but perfected with Double Jeopardy. I remember watching the trailer in the theater and thinking, "End! End! Please!" I briefly considered running out of the auditorium, but I ultimately concluded that putting my hands over my ears and singing "LA LA LA!" was my best bet (it quickly freed up the armrest next to me as well). Alas, I'd already seen too much, and I feared my enjoyment of the film had been compromised. Luckily, I was incorrect. True, the narrative of Cast Away is compelling, but ultimately, it is more about the journey than the destination. Surprisingly innovative and philosophical—almost spiritual—Cast Away is an amazing, complex piece of filmmaking and one of the best "big budget" productions in ages. Chuck Noland (Hanks) is married to his job. As a Federal Express manager, he "lives and dies by the clock." He barely has time to further his romantic relationship with his girlfriend, Kelley (Hunt), a grad student also familiar with a hectic schedule. During a holiday delivery run, Noland's plane encounters a violent storm, and he is the only survivor of a horrific crash. After a harrowing night on a rubber raft, he finds himself on a deserted island; his only companions, the varied brood of marine life. Thoughts of rescue quickly turn to thoughts of survival, as Noland attempts to create a life for himself using only his wits and the contents of a few Fed-Ex packages that have washed ashore. In one, he finds the savior of his sanity: a volleyball that is quickly (and humorously) personified into Wilson, his constant companion. As time slips by, Noland is transformed, both physically and spiritually, as he comes to grips with isolation and fear. Tom Hanks, truly one of the most popular actors of all time, gives his best performance as Chuck Noland, one seemingly tailor-made for an advertising blurb. Take your pick - masterful, towering, virtuoso - all are equally applicable. It's more than his physical degradation (accomplished through a year break in filming); it's the profound emotional change as well. As Noland's stay on the island stretches into years, Hanks is able to, just through his eyes and his posture, exhibit the profound change in this man's character - both a newfound determination and a perpetual sadness. For nearly 80 minutes of film, Hanks performs without the support of score or other actors, and he holds his own for every second, something not many actors could do. I could be overly clever ("What, you?! ", the reader gasps) and suggest that nods for Best Supporting Actor were deserved by the wily Wilson, but I'll give credit where credit is due. Wilson is a true accomplishment. What could have been laughable is touching, and he (it) truly becomes a part of the film, someone the audience cares about. Without Zemeckis subtle direction and careful use of character, and without Hanks' utterly sincere reactions to what is essentially a prop, the idea would've been a total failure. Instead, the mischievously grinning piece of sports equipment becomes a film highlight. William Broyles' screenplay went through countless revisions over a four-year period, but it doesn't feel tired. The three-act structure breaks down further into segmented, almost episodic glances at island survival. The seemingly free-flowing film actually separates down into clear story beats, with each survival task Noland performs clearly structured as a mini-play in itself. The spiritual center of the film, Noland's inner struggle, is hauntingly stark and subtle. There is no heavy-handed philosophizing, only an affecting, honest character progression. Only in the final moments does the script lose its way, with a melancholy close (and a blindingly obvious visual metaphor). Of course, it is Zemeckis' even direction that keeps the action moving, a difficult task in a film where little actually "happens." He injects real drama not only into the plane crash and the raft sequences, but into the opening of a coconut, the catching of a fish. And once again, he masterfully uses his trademarked invisible special effects. I was surprised, while watching the special features, to see just how much of this film was digitally tweaked. It's nice to see a director who realizes special effects are to support and augment a script, not overshadow it. Despite favorable reviews and a real connection with audiences, Cast Away failed to clinch an Oscar�® nomination for best picture. And while it may not have been the greatest film of the year, it's certainly more complex, innovative, and moving than 99% of Hollywood's usual output. Image Transfer Review: This DVD simply looks beautiful. Unfortunately, as with many DVDs from the Digital Video Compression Center (DVCC), this one at times contains some visible edge-enhancement. It's nothing seriously distracting, but if you are the type to notice such things, you'll see it here and there. Other than that, I'd say Fox has produced a contender for best picture quality of the year. Fine detail is very impressive, along with excellent depth of field. Many of the island scenes appear to be in 3-D, the image is so clear. Much of the film happens at night, and the scenes have an interesting midnight blue tinge (they were shot "day for night"). These scenes look great, with excellent contrast and a decidedly un-digital look. Even on my 4:3 set, this looks to be reference quality. 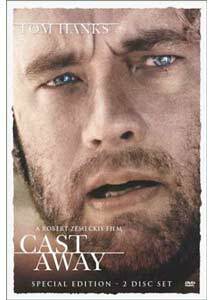 Audio Transfer Review: Let me say this: Cast Away does not feature your traditional demo soundtrack. There are few flashy effects thrown in just for the sake of sounding impressive on a home set-up. Rather, this track reveals the intricate, complex world of sound design. All of the island sounds were created from the ground up and carefully mixed to serve as the film's pseudo score (the island scenes feature no music). Following the very impressive sonic assault that is the plane crash scene (where we are put inside the plane, as we hear it falling apart from Chuck's perspective), the soundfield opens up to become one of the most innovative I have heard in quite some time. The phrase "surround use" takes on a whole new meaning, because they just don't shut off. For a solid hour, the film features an entirely enveloping mix that constantly uses directionality and split-surrounds to create a realistic island feel. There aren't any animals, birds, or bugs in the mix, which makes it all the more impressive. This feeling of immersion is accomplished only with sounds like fire, wind, waves, and rustling leaves. Off the island, the mix features a bit less directionality and surround use, but the surrounds nicely support Alan Silvestri's score. Both a DD EX and a DTS ES mix are provided. I sampled both, and found them to be excellent. However, the DTS features a more defined separation between channels and a more clearly unified feel. Extras Review: In the past year, Fox has produced some of the most comprehensive DVD sets on the market. While Cast Away doesn't break any new ground for the format (from packaging to content, this is very similar to the Gladiator set), there are plenty of interesting supplements to keep film fans happy. Commentary tracks are usually the first extra I'll watch, since I absolutely love a good one. For the first ten minutes, I was afraid this one, featuring Zemeckis, director of photography Don Burgess, visual effects supervisor Ken Ralston, co-visual effects supervisor Carey Villegas, and sound designer Randy Thom, was going to be a tiresome chore. The edited-together feel was annoying, and the discussion dwelt on the minutely technical. However, once the plane crash sequence began, things picked up with the discussion of the impressive effects. By the time Hanks found his way to the island, I was immersed. The group covers every aspect of production, with extensive coverage of both the seamless special effects and the impressive sound mix. Overall, the presentation is a bit dry, but I found it thoroughly entertaining and informative. This track is the only extra on disc one; the rest of the documentaries and features are housed on disc two. Rather than one long piece on all aspects of the film's production, Fox has broken down the extras into documentaries, featurettes, and effects demonstrations. The HBO piece, entitled The Making of Cast Away, runs about 24 minutes and is your usual "let's spoil the movie" hack job. The creator of Cliff's Notes may be dead, but his spirit lives on in the promotional EPK. There is some interesting material here, but most of it is reexamined in the other featurettes, and make sure not to watch this thing before the film (but really, who would?). The other three pieces are much better, and at least a bit less promotional in tone (even if all three feature footage shot for the HBO doc). S.T.O.P. : Surviving as a Castaway sounds more interesting than it is. Survival experts who worked on the film as consultants talk about methods of survival and how accurate the film representation is. Here and there, I found the material kind of informative, but the format was somewhat monotonous - about 25 minutes of "talking heads" - that I began to lose interest. Actual footage of the guys at work would've helped (they all seem to be quite "eccentric"). The Island is a 15-minute look at the geography of Tom Hank's isolated home. Behind-the-scenes footage offers a glimpse into the difficulties of shooting on-location and away from civilization. It is also interesting to see undoctored footage of the location, so you can get a better idea of all the computer effect work that went into the island scenes. Wilson: The Life and Death of a Hollywood Extra is a tongue-in-cheek, 9-minute look at Wilson's meteoric career in pictures. From his salad days as a plain volleyball, to his triumphant, dramatic turn with Hanks, Wilson is truly one of the must unappreciated method actors of our time. I like the slow-mo "best of" reel at the end. Cute. A long form interview with Hanks, from The Charlie Rose Show, will no doubt interest some, but it bored me. At times, Rose is an excellent interviewer, but he just isn't able to pull anything interesting, amusing, or revelatory from his subject this time. Also, prods like, "Explain the genius of Bob Zemeckis" just annoy me. The two spend equal time on this film and Saving Private Ryan, with brief mentions of more of Hanks' best roles. Six special effects vignettes (oo la la!) show CG footage repeated through various stages of development, with commentary from the FX team (for the sections "The Plane Crash," "The Island Revealed," "Climbing The Mountain Top," "The Wind Changes Direction," "The Raft Goes Over a Big Wave" and "The Whales"). These are quite interesting, but they move very quickly, and I would've liked to have the option to use the multi-angle feature. The storyboard-to-film comparisons are presented in still form, with three images to a page, matched to the respective scenes from the film. The Behind-the-Scenes Image Gallery is a 5-minute long series of stills, backed by the score. The Conceptual Artwork, Illustrations and Storyboards, and Video and Stills all offer more traditional, step-through image galleries. Two theatrical trailers and ten TV spots cram the marketing strategy down your throat. I also stumbled across a brief, funny easter egg, which may or may not be worth your time to locate (it depends if you've heard the joke before - I had, it was in Entertainment Weekly). As you can see, this is a nice set of suitably varied extras. All of this material is tied together with elegant, functional animated menus, the best I've seen in a while. Cast Away once again successfully teams Tom Hanks and Robert Zemeckis. Last time, the two produced Forrest Gump, one of the best-loved films of the 1990s. This time, the result is another popular box-office success: a genuine, spiritual, intellectual, and perhaps superior film. Fox has produced another stellar DVD set, and at $29.99, this one is tough to criticize. Recommended.